You are here: Home / Chapter 7 Bankruptcy / How Soon Will I Get Credit After Filing Bankruptcy? How Soon Will I Get Credit After Filing Bankruptcy? It’s amazing to me that people are worried about getting credit before they even completed a bankruptcy case. This is due in fact based upon Americans desire and obsession for credit. After all, credit is what more than likely got the person into financial problems to begin with. 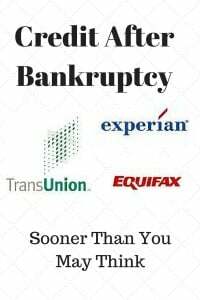 Now there are other causes of bankruptcy filings such as medical bills, job loss, illness, divorce, but the main reason why people fall into bankruptcy is due to credit. It seems that everyone is obsessed with credit and their credit scores. People want to know how is bankruptcy going to affect my credit score? I have to look at these potential clients in bewilderment. Why on earth are they asking me about what the drop in credit score will be instead of asking me how can I get out of this debt? After all, the credit score is really insignificant when you’re carrying insurmountable debt. The good news for people is that their insatiable appetite for credit will be restored shortly after a bankruptcy filing. For example, immediately after filing a Chapter 7 bankruptcy case, you as a client will be offered auto financing. Now don’t get me wrong, the interest rate will not be as good as it was before you file. The amount of credit that’s going to be extended will not be as high as before you file. However, for someone looking to rebuild their credit, financing a vehicle immediately after a bankruptcy case is a good idea. In terms of unsecured credit such as credit cards, you’re going to have to wait anywhere from six months to two years to get a decent offer for unsecured credit. These lenders know that you cannot file another chapter 7 bankruptcy case 4 eight years. For that very reason, they are hoping that you will use credit to a certain extent and continue to pay higher interest and annual fees. For those looking to purchase a home after a bankruptcy filing, I recommend waiting at least two years. Although it is possible to get financing after one year of filing, it is best to wait two years to obtain a better interest rate. In the interim, you can continue to live in a rental unit. Most clients are concerned about whether or not they’re going to be able to rent an apartment after a bankruptcy filing. I assure them that as long as they can put a security deposit down and as long as they can make the monthly payment, they will have no problem renting an average apartment. Now you may not be able to live in the most extravagant and high-end apartment complex. However, you will be able to rent an apartment, rest assured if you have the ability to pay. I am hoping that someday soon the culture’s obsession with credit and credit after a bankruptcy will subside. I would like to see more people use cash and rely lesser and lesser on credit. Studies have shown that when people use cash they wind up spending a lot less on particular items. This is especially important for someone who has just filed and is concerned about credit in the future. That person more than anyone needs to shy away from credit and needs to pay cash so that they can actually see what’s going out immediately. That luxury of putting something on credit, having it now, and paying for it later, is a disaster waiting to blow up. The smartest thing you can do after a bankruptcy filing is to be very cautious on seeking any type of credit. It is not until finances are under control and budgets are kept in check when someone should then start to seek credit opportunities after a bankruptcy filing.